While on earth Jesus built a team of disciples to be with Him and work in cooperation with Him. After ascending to heaven, Jesus established the biggest team ever … His Church. Two groups, the Jews and Gentiles, were brought together as one to represent Him to the world. If we want to aim for Christ-like character in our churches, then we need to learn to function interdependently as a team, as members of one another. If we aren’t exhibiting this team-mentality within our small organizational groups such as boards or committees, can we really expect to see it church-wide? 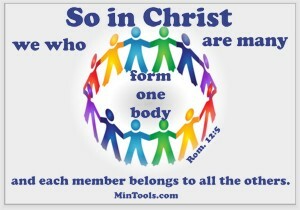 As has been previously discussed in this practicum, some churches, in an effort to reflect this Christ-like trait have changed the name “committees” to “ministry teams”. While that can be helpful to communicate what should be happening, it does not guarantee they will function accordingly. Below you will find two traits listed together. If boards or committees function according to the first trait, the second will be more likely to follow. Certain traits will be an outgrowth of others. Jesus was committed to the purpose for which He came to earth (Jn. 17:4), but also to His disciples (Jn. 17:12). And, He expected His disciples to be devoted to one another as well (Jn. 17:11; Rom. 12:10). To function in a Christ-like manner, boards, committees, or ministry teams must likewise be committed to the greater good, one another, and their purpose for coming together (Phil. 2:1-4). With such a commitment, members should be more willing to coordinate their efforts for the greater good. If not committed to one another and their purpose, they will be less likely to work in coordination with each other. Jesus not only communicated with the Father (Lk. 6:12), but He also communicated with His disciples (Jn. 15:15; 17:7-8). And, He encouraged such comradeship among the disciples (Jn. 15:12). To function in a Christ-like manner, boards, committees, or ministry teams must likewise provide an atmosphere conducive to open sharing of ideas, receiving input, and acceptance of one another even when ideas conflict (Rom. 15:7). With such communication comes a greater potential for community as members learn and grow together. Jesus could have gone it alone in His earthly ministry but instead gathered a group of twelve to work together in cooperation with Him. He could have been autocratic in His approach but rather acted as a servant (Phil. 2:5-11). As such He engendered their cooperation wherein they responded because of love not duty (Jn. 14:15). With such collaboration among board or committee members, each having an “ownership” in the process and decisions, tends to come greater cooperation. This entry was posted in Boards, Committees, Ministry Teams .